DISH Network L.L.C. (DISH), headquartered in Englewood, CO, began as a tech startup in 1980 installing big satellite dishes in rural Colorado and connecting people to a new world of entertainment. The company grew, took risks to succeed, and launched a small dish satellite service in 1996. Since then, it has pioneered technology from the Hopper smart DVR to Sling TV, a live and on-demand over-the-top (OTT) TV service. Today, DISH has an estimated 14 million subscribers and employs 16,000 people in the U.S. DISH operates in the confluence of several highly competitive industries: technology, entertainment, and telecommunications. To be competitive, speed is essential. DISH was seeking to hold on to its innovative edge, delivering new technology to consumers faster with a reliable experience. The company was long familiar with building applications, but to the world it was becoming “apps.” DISH needed to continue to innovate for customers with things like Sling TV, an OTT app available on multiple streaming and mobile devices. It needed to constantly evolve DISH Anywhere, the mobile TV solution for DISH satellite customers. It needed to support its nationwide network of thousands of installation and repair technicians with more technological tools as they visit tens of thousands of homes every day. And most importantly, it needed to attract the right talent to deliver innovation. Company executives began to look at different cloud platforms and software frameworks that would improve speed-to-market. Pivotal’s Cloud Foundry® native cloud platform aligned well with those objectives. DISH also decided to engage with Pivotal Labs® to learn different and valuable techniques to deliver software faster. DISH adopted Pivotal’s agile approach and Pivotal Cloud Foundry as the platform to enable strategic business initiatives. A key insight DISH learned from Pivotal Labs was to tear down its walls, literally. Cubicles became pair programming stations. The first project was focused on creating an application to update offer and order management at DISH. Then the business sought to create an application to streamline its sales interactions with customers, as well as its installation and fulfillment services. While the launches of the new applications were successful, the development process also showed the ability to produce significant value. After training developers in paired programming and test-driven development, DISH introduced a “guest developer” program in which members from other teams would sit in and learn the agile development model. Soon thereafter, the company built DISH Grand Central, a brand new software development office in downtown Denver. We completely renovated this historic building with the look and feel of a startup, where developers are working in pair programming stations to deliver apps for consumers and employees." Teams at DISH Grand Central are testing early and often, and decisions are made at the line of the code, not in a separate conference room. The modern platform gives back hours and days to developers who prototype and innovate new ideas into apps. DISH developers focused on delivering innovation at scale and with speed. Conversations are overtaking the clack of keyboards. IT software release schedules have turned from months into weeks. Teams that once rolled out a quarterly release are now operating on bi-weekly releases. The customer experience is constantly evolving because it is so much easier to introduce new apps and new services to meet customer requirements. In addition, enterprise tools for the company can now evolve quickly. 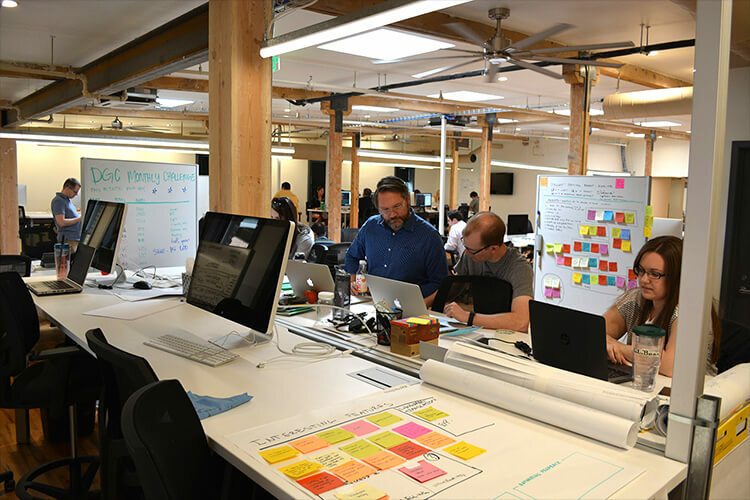 The efforts to build a new office in downtown Denver and change-up the development environment at corporate headquarters to support DISH’s new agile development practices have been incredibly successful. With the support of Pivotal Labs to offer training in paired programming, DISH has built a pool of developers across the organization with higher levels of expertise and is continuing to expand that base. Check out the DISH Grand Central site if you’re interested in joining their team. 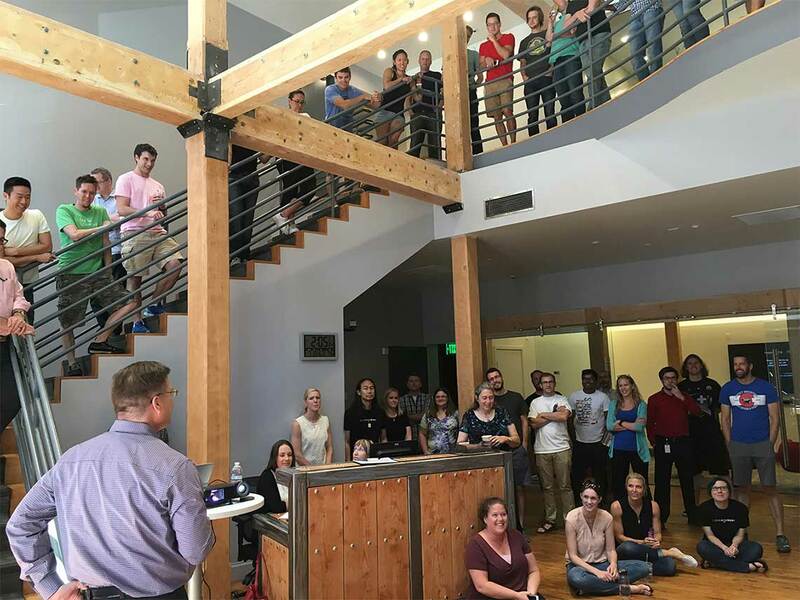 Today, with a modern development environment at its new downtown Denver location and at corporate headquarters, the right tools—such as Cloud Foundry—and a staff of developers fully trained and engaged in agile development, it is now possible to more quickly translate DISH’s product roadmap into reality and generate real value to the business.